Kent Hovind to Rudy Davis & Erin Davis! – Kent Hovind v. Robert Baty – The Great Debates! Robert Gobelet on Kent Hovind! Home→Kent Hovind to Rudy Davis & Erin Davis! Kent Hovind to Rudy Davis & Erin Davis! 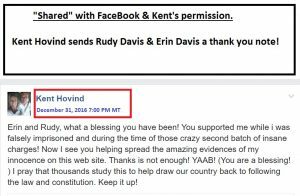 The following message was apparently the direct result of Rudy and Erin Davis broadcasting a false and/or misleading report via YouTube, on December 31, 2016, in support of Kent Hovind’s false legal narrative as is now being promoted by Brady Byrum via a series of DVD’s and a scam to get people to sign affidavits and send them to various government officials as if that effort would result in a formal government investigation of Kent Hovind’s 2006 criminal case, the impeachment of Federal District Judge Margaret Casey Rodgers, a reversal of Kent’s convictions, and the payment to Kent Hovind of up to $30,000,000.00 for false imprisonment. To date, neither Kent Hovind or Rudy Davis or Erin Davis will come out into the public square to face the charges against them; nor will they send out their Champion. This website has been designed to counter their false narrative. What a blessing you have been! of my innocence on this web site. country back to following the law and constitution.